On Sunday night Nine premieres A.D.: The Bible Continues, a sequel to its 2013 series The Bible (which frankly, I thought was a stinker). Again coming from producers Mark Burnett and Roma Downey, this 12 part series begins with the crucifixion of Jesus, and continues with the first ten chapters of the Book of Acts. This time Jesus is played by Juan Pablo Di Pace not Diogo Morgado (would that make it a Bewitched-style switcheroo?) while Aussie-Italian Greta Scacchi plays Mother Mary. 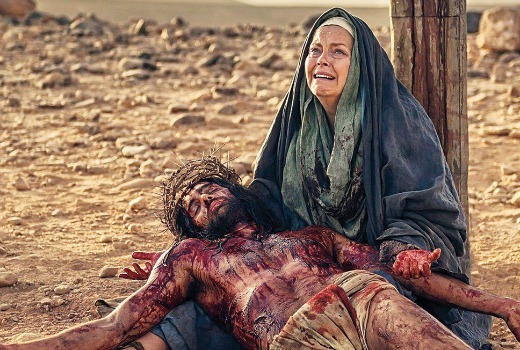 Peter and the disciples experience their darkest hour in the premiere of this miniseries that dramatizes the impact of Christ’s death on his disciples and the era’s leaders. Seems Jesus can regenerate, well the Tenth Doctor said he was at the first Easter. Agree Jake S – haven’t watched an episode yet but continue recording it. Nine seems to dump an episode nearly every second week. Let’s just hope Nine doesn’t bump Stalker again.